A majority of amateur golfers just walk up to the first tee without properly warming up for their 18 holes. Are you one of them? Participants who are short on time, but want to go straight to the first tee will still benefit from a quick five minute golf warm-up that involves these dynamic stretches. A quick static stretch that lasts just over a minute is often what people default to, but static stretching actually decreases power output and strength when done immediately before an activity, like trying striking a ball 200 plus yards. Dynamic stretching before golf gets you limber and your swing feeling free before you hit the first tee. It warms up the muscles to be elastic, increases synovial fluid in your joints, raises your heart rate, while preparing your neuromuscular system and mind to play golf. 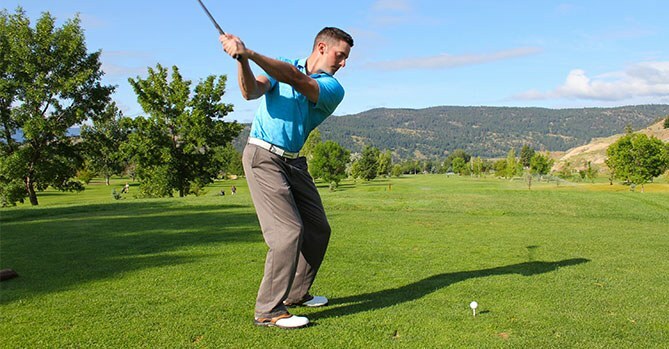 Use the following five movement based golf stretches to get you feeling limber early instead of waiting until the 9th hole to get into the swing of things. Hint: you only need to do each exercise until you feel “loose”. Start each warm-up with long slow breaths and small slow movements, then work towards faster and larger movements. Pay attention to each side. Notice if you find one side or one direction tighter, then focus on getting the tight areas feeling loose and moving with minimal restrictions. Stand with your feet hip-width apart. Imagine you have a hula hoop around your waist. Rotate your pelvis in clockwise circle until it feels loose, then switch directions. Still with your feet wide, reach one hand overhead to the sky and then to the other side. Make sure to feel this stretch on the side. Continue by reaching on the diagonal to the opposite side, making a circle until you reach your starting side. Repeat several times until loose, then change sides. Did you know we move in spiral diagonal patterns? Remember kicking a ball as a child? Stand on one leg and use your golf club for support if you need to. Start with the swinging leg bent and be loose from the hip. Moving from the hip, make figure eights. Gradually make these swings larger and faster; the upper-body will move. Your leg will move in front and behind you spirals and diagonals, and your foot will point in many directions. To really be loose and free in the shoulders, we need to swing the arms. Start by slowly swinging your arms at your sides, forward and back. Make this movement larger as you gradually go faster, and are breathing faster. Swing your arms back and forward, reaching as far as you can — even over-head. Do the same thing by crossing your arms, then reaching to the sides. Move from the ground to the ground to reaching overhead and out. Your shoulders should feel easy to move when you are finished. Your breathing rate will increase as each stretch quickens and the movements become larger. When done properly, you will feel warm, limber and your heart rate will be higher. Your mind will also be ready to play golf. Do these dynamic (with movement) stretches for until you feel loose. Following-through with the above golf warm-up routine will boost clubhead speed, ball speed and yards off the tee. Try this 5-minute golf warm-up and leave your comments below to let us know how you played. References: Ann and Chris Frederick, Stretch to Win, Human Kinetics. CEO | Practicing Kinesiologist | Certified Fascial Stretch Therapist. He founded Lifemoves in 2007. He has been a Practicing Kinesiologist and Certified Strength and Conditioning Coach with the NSCA for over 15 years. When he isn't helping people regain their strength and confidence to move with ease he is hanging out with his wife and young son, writing, or training for his next endurance running race. His big audacious goal is to qualify for the Boston Marathon. Do you want to move with greater ease? Start feeling the benefits of Fascial Stretch Therapy by booking your appointment today.